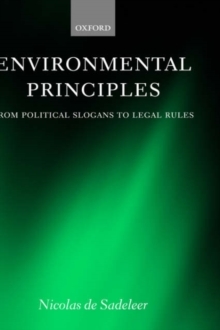 This book traces the evolution of environmental principles from their origins as vague political slogans reflecting fears about environmental hazards to their embodiment in enforceable laws. Since the early 1970s environmental issues have taken on an ever increasing profile. This has been due in part to a fundamental change in the type and scale of risk posed by industry. Issues such as global warming, GM food, and mad cow disease typify the new kinds of risk:potentially catastrophic consequences could ensue yet there is no scientific agreement over their precise causation, duration, and other concerns. Environmental law has always responded to risks posed by industrial society but the new generation of risks have required a new set of environmental principles, emerging from a combination of public fears, science, ethics, and established legal practice. 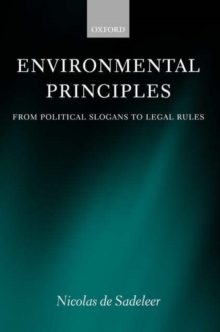 This book shows how three of the most important principles of modern environmental law grew out of this new age of ecological risk: the 'polluter pays' principle, the preventive principle and the precautionary principle. 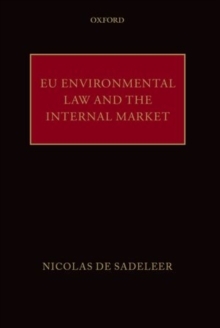 The author examines thelegal force of these principles and in the process offers a novel theory of norm formation in environmental law by unearthing new grounds of legality. The book will be of value to all those with an interest in environmental law and policy, in the relationship between law and science, and in the ways in which political and ethical values can become embodied in laws.